You hear so much about Medicare enrollment. At certain times of the year it's hard to escape it with advertising all around us. But what you seldom hear is that beneficiaries can disenroll from some parts of Medicare and enroll in other coverage outside the annual enrollment season. 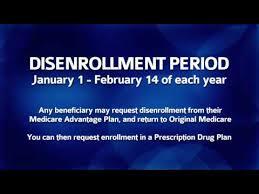 We are in the middle of the Medicare Advantage Disenrollment Period, also referred to as MADP. To be eligible for MADP, recipients must have a private Medicare health plan — known as a Medicare Advantage plan or Medicare Part C. During MADP, beneficiaries can elect to drop their private Medicare coverage and return to original Medicare. The window of opportunity runs from Jan. 1 through Feb. 14 every year. Changes made during MADP go into effect the first day of the following month. Why would anyone want to disenroll in a Medicare Advantage or Medicare Part C plan? If your clients are experiencing any of these situations and have Medicare Advantage, now is the time for them to take action and reduce unnecessary medical spending and hassles. The chance to make changes ends at midnight on Saturday, Feb. 14. 1. If the Medicare Advantage plan includes prescription drug coverage (which most do), beneficiaries should sign up for a Medicare-approved Stand Alone Prescription Drug Plan (Medicare Part D plan). Recipients can call 1-(800) MEDICARE 24 hours a day, 7 days a week to speak to a representative and sort through options. Going without drug coverage results in even higher costs and penalties. 2. Original Medicare does not pay for 100% of care. People must cover copayments, deductibles and coinsurance. Medicare also has no out-of-pocket limit. Without Medicare Advantage coverage, beneficiaries must pay all those expenses and can easily have significant out-of-pocket outlays. To limit those, recipients are well-advised to apply for Medigap supplemental coverage. The MADP doesn't guarantee the right to buy a Medigap plan; states may have more rights. Individuals can check with their State Health Insurance Assistance Program. ShipTalk.org provides local re-sources for advisers and their clients. Regardless, most people will qualify for a Medigap plan. But word to the wise: Clients should apply for the Medigap coverage and get approval before canceling their current coverage. When you assist clients with their pressing Medicare concerns, they benefit by spending their health care dollars more wisely. That helps ensure the safety of their retirement nest egg and improves their access to the health care they need.